Cisco HSRP Configuration | CCIE or Null! Let’s configure HSRP – Hot Standby Router Protocol. I covered VRRP a few weeks back, which is a vendor neutral FHRP, but now let’s take a look at HSRP which is more or less a Cisco proprietary version of VRRP. With the exception of the standby keyword this configuration is almost identical to our previous VRRP configuration, and the joy of this is the fact these commands pretty much mean and do the same thing. 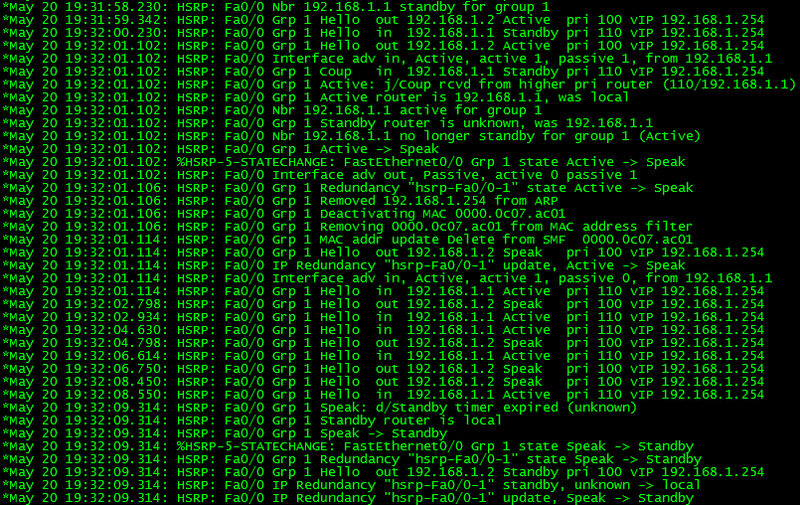 Standby 1 specifies our HSRP group ID or instance, Standby 1 ip 192.168.1.254 is the HSRP virtual address. Standby 1 timers 2 7 specifies how often HSRP will send out hello packets every 2 seconds in this case and if hello packets are not received within 7 seconds that HSRP speaker is removed from the HSRP group. Standby 1 priority 110 sets this device’s priority within the HSRP group the default priority is 100, and the device with the higher priority is the device that will be the HSRP active router. Standby 1 preempt delay minimum 15 tells this router to take the role of the active router if it were a standby router or if the router has a higher priority and is entered into a group, it also tells the router to wait 15 seconds before taking back the role of the active router. Those 15 seconds should provide enough time for the router to accept any routing updates from its neighbors and have a fully converged routing table so it does not blackhole traffic when it becomes the active HSRP router again. Standby 1 track 1 decrement 100 tells the router to decrement the HSRP priority by 100 if the tracking status of tracking object 1 goes down, and tracking object 1 is configured to track the line protocol of fastethernet0/1/0. Above is some debug output of the a standby router becoming the active router, from the above output you see the last hello packet received was 19:31:21, and at 19:31:28, 7 seconds later the holdtime expires and the local router becomes the active router. Then I connected the original active router back into the network, and you can see the coup message received from 192.168.1.1 stating it has a higher priority, the coup message is what tells the current active router that another router has joined the group with a higher priority and it’s assuming the role of the new active router.